If you have been using iTunes to manage your music collection over the years but have recently moved to using an Android device, this article will help transfer your iTunes music library to Android. iTunes is great for managing your music on Apple device's, but unfortunately, you can use iTunes on Android. The application which can assist you to sync iTunes to Android is Droid Transfer, which not only transfers music from your iTunes to your Android phone, but also keeps the media on your Android Phone in sync with your iTunes library as you continue to add music to either iTunes or your Android device. You can get the Transfer Companion app completely free on the Google Play Store, while Droid Transfer for PC is available as a free trial download. Both apps are needed to sync your Android device with iTunes. 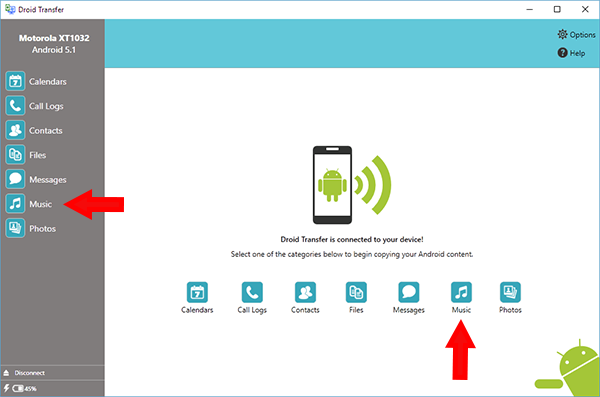 The free version of Droid Transfer allows you to copy up to 50 songs to and from your Android device, while the full version is unlimited. In Droid Transfer Click the Music Icon - Droid Transfer lists the music currently on your Android Device. Click the "Sync with iTunes" button on the control bar. Droid Transfer will run iTunes and read your iTunes contents. Droid Transfer will compare the music on your Android device and compare it with your iTunes music library. 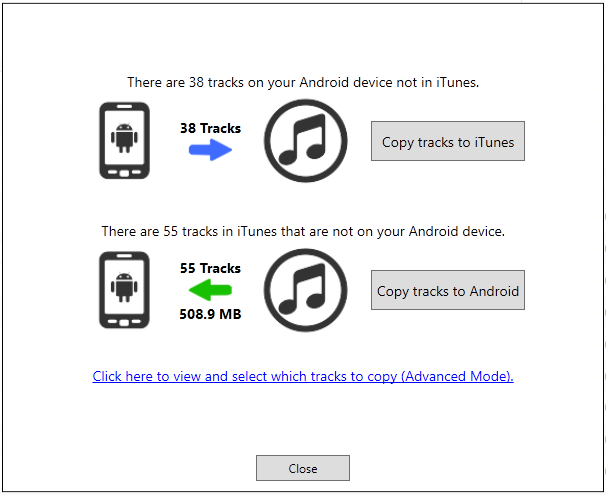 Droid Transfer will show how many tracks are on your Android device that are not in iTunes. Click "Copy tracks to iTunes". Droid Transfer will begin to transfer the missing iTunes tracks from your Android device. 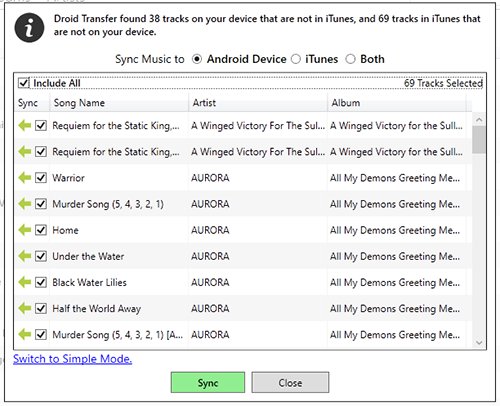 Droid Transfer shows how many tracks are in iTunes that are not currently on your Android device. You will also see the total file size of those music files. If your Android device has enough free (internal) memory space to hold all of the music, click "Copy Tracks to Android" to transfer all the tracks to your Android device. If you do not have enough space on your Android device to hold all of your music in iTunes - Droid Transfer will tell you so. You have the option of selecting the music you wish to copy over from iTunes. See "Using Advanced iTunes Sync Mode"
Now that you have copied music to and from the Android device and iTunes - the music collection on your Android device and your iTunes library should be the same. If you add music to your iTunes library later on - run Droid Transfer again to copy that new music over to your Android device. 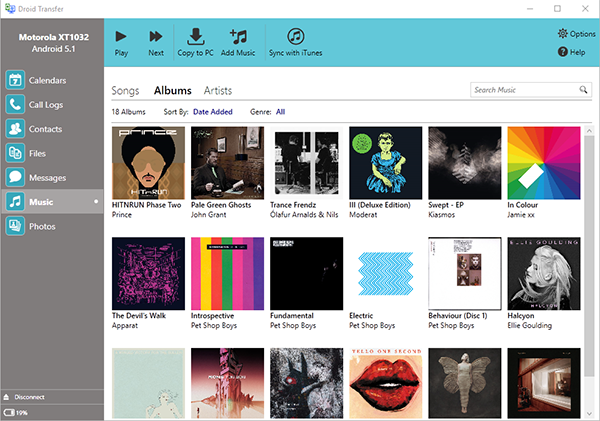 Advanced Syncing allows you to see which tracks will be copied from and to iTunes before any syncing takes place. You can also select which tracks to copy to your Android device if you do not have enough space on your device to hold all of your iTunes music. To start Advanced Mode - click the link "Click here to view and select which tracks to copy (Advanced Mode)". This will open the Advanced sync view.